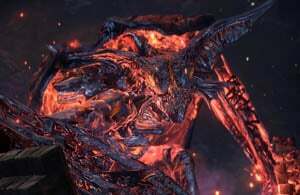 Demon Prince is a Boss in Dark Souls 3, available with the Ringed City DLC. You can summon Slave Knight Gael to help you fight this boss. Summon sign can be found beside the Bonfire before the fight. You can summon Lapp to help you fight this boss. Summon sign can be found on the ledge before you drop down. Must be defeated in order to reach The Ringed City. 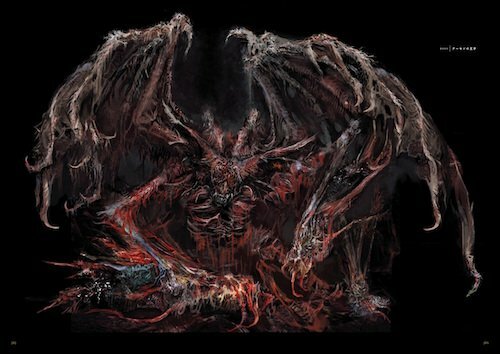 The Ringed City: Demon Prince is the second phase of the Demon in Pain & Demon From Below boss fight. You have to defeat the Demon in Pain & Demon From Below EVERY time you re-attempt the boss fight. Demon Prince's attacks deal Fire Damage and Physical (Slash/Standard?) Damage. Can be staggered, which may give players an opportunity to perform a critical strike. Neutral to Physical/Bleed, and Dark Damage. Has the same amount of Bleed resistance as the Demon in Pain and Demon From Below, so Bleed is just as effective. Highly resistant to Fire Damage, Lightning Damage, Magic Damage. Immune to Frostbite and Poison/Toxic. For this strategy, you have to play Co-op. Many say to use only one summon, but using both Amnesiac Lapp and Slave Knight Gael is an amazing combination because they heal themselves constantly, and draw aggro so the player can have huge windows to do damage. If the player is adamant about using only one, or is doing better with just one for some reason, it is better to choose Lapp as he does similar damage to Gael, but takes more damage easier than Gael does. In this phase, while Gael or a player aggroes Demon in Pain, you will focus on Demon from Below. Now, the strategy will change depending on if the Demon from Below is or not on fire. An important note is that a good shield for this fight that resists high physical and fire can come in handy blocking their attacks. If the demon you're facing is burning, then you'll mostly want to stay under or behind his legs, as he will have difficulties reaching you to make damages, while you'll be able to attack him all you want. Now, it might seem like a really basic advice, but don't use up all your stamina, since you'll need it if you have to dodge. Green Blossoms can help, in order to land more attacks, while still being able to dodge after. If the demon you're facing isn't on fire, stick to his face like a bubble-gum sticks under a high schooler's desk. This way, if the demon barfs, you won't get hit nor poisoned. However, if he slowly rises on his legs while raising his arms, that means he wants to slam you, so turn around him, and dodge if necessary, then go back to his face. When your demon is dead, go finish the other. Now, the second phase begins. In this phase, you're fighting the Demon Prince, who is always burning. Simply repeat the strategy for the burning demon by staying under or behind his legs, as his physical attacks will be almost if not the same. Be wary of two things though: his charge, and his magma shower. For his charge, he will create some distance between you and himself, and then charge you while leaving fire in his trail. I don't really have advice for dodging him, since I only got hit once, while the other time he tried it on me, he completely missed me, so you're on your own for this. His magma shower will happen after he makes 2 floating turret-like fire orbs, which is followed up by spewing fire in the sky after making some distance between both of you. Now, I advise you to do what you can to interrupt him, while dodging the projectiles shot at you by the fire turrets. The three demons can actually be staggered, and then you can land a critical hit by attacking their face. Finally, just be patient, focus and attack when you can. Good luck! First of all, if you stay in the ring at the beginning (don't cross the bricks) both demons will always begin with same moves. Staying still and charging R2 to attack the demon who's jump attack barely misses you is a good way to get some easy damage in. Also they do not immediately regroup so focusing on one demon at the beginning and killing it fast before the other drifts too close is a solid strategy. Three rules of thumb: get near it, walk right and always stay locked on. This way you will mostly trigger short range moves that are punishable just by rolling below it and attacking like before. Staying locked on helps when it jumps up to do explosive punch dive. It is very difficult to dodge blindly. If it does a short jump behind you while you are near, it will always either swing too or punch the floor creating a homing fire trail. If its right hand slowly forms a fireball it is about to jump up and throw a homing fireball at you. It always jumps little backwards so blindly running towards the direction of where its back was facing usually avoids the attack and let you close in and attack before it recovers. If it slowly summons two fireballs it is later about to jump away and conjure the meteor shower. Both are excellent opportunities to attack and hope for a chance to stun and visceral attack it. Great thing is, if you stun it during the summoning of first two fireballs, it will do it again after it recovers from your visceral attack. 1. The boss fight will open up with both the Demon In Pain, which is on the right, and Demon From Below, which is on the left. The Demon From Below will be glowing a bright color, and this is a sign that he is doing melee attacks, and berserking at you. He will start off with a delayed jump attack. Roll into his safe spot, which is his rear and side pelvic region, and get in some hits. 2. In some moments, the Demon From Below will stop glowing, but his brother will start to glow. This means you should focus on the currently glowing brother, as you have to kill both enemies anyway. When a demon is spraying toxic, he is more open to being hit, but it is easy to get flanked by the berserking demon. If you can, hit the demon's head to stun and riposte him for bonus damage. If you can, try to kite the demon who is charging and throwing melee attacks at you so they are separated. 3. This fight is largely about timing stamina. The bosses want you to think that you can deplete your meter, but their follow up combos are extremely powerful (600-900HP damage per attack easy) and you really don't want to get hit by those. Using a shield here will be foolish, as your stamina will be too drained to do the maximum of five rolls needed to attack. 4. The timing for these demons' attacks is among the most irregular in the whole game. You have to really be conscious about your dodges because the Demons try to roll-catch, and wait for you to dodge so they can hit you on recovery. s body, or "wall-banged", by the other demon. 6. Now for phase two. The Demon's special attack is either going to be a persisting beam, or a shower of fireballs, followed by an AOE, and floating chaos fireballs. It doesn't matter which one you kill first, but the laser beam demon (Demon From Below, I think) has a much bigger opening, as he is sedentary for about ten seconds while he is firing his laser in a three attack combo (which, I think ends in an AOE). Again, always leave enough stamina to dodge roll up to five times, because any of the three Demons in this fight can kill you in two hits, easy. 7. For all three parts of the fight (two demons, one demon, then demon prince), keep your punishments short, and focus on out-lasting the bosses. Put the rest of your focus on dodging their insanely fast attacks, as well. 8. The Demons have a berserk attack where they march toward you, and claw into the ground, repeatedly, much like how a gorilla gallops on its knuckles when it is trying to scare off something. Trying to dodge only one claw saves more stamina than trying to dodge both! 9. The Demon Prince (third phase) has an attack where he flies and swoops down, grinding his claws into the ground. For this attack, since there is somewhat of a strange zone of effect, dodge rolling to the sides works much better than to the front and back. If you have 30 intelligence, equip Pestilent Mist as the damage it deals is a set percentage of the enemy's max HP. It will deal massive damage in the second phase and some attacks have him standing there without moving for a while. Try to get behind in that situation and cast Pestilent Mist Back off and shoot him with additional spells. Recommended to exploit both Phases' weakness. Equip Dorhys' Gnawing, as a fail safe it is recommended to cast Tears of Denial before you drop down into the fight, also to get at least 1 Phantom (Lapp for example) to distract one of either Demons of your choosing. It is helpful to equip the following rings: Morne's Ring, Ring of the Sun's First Born & Dusk Crown Ring; if possible also equip Carthus Bloodring for better chances of dodging at the cost of weaker defense. This should however not be a problem since the attacks of either demon are slow by comparison. The tactic is rather simple: Keep your distance and keep casting Dorhys' Gnawing, roughly every 2nd to 3rd hit resulting in bleed-burst damage. Thanks to Farron Ring you will be able to cast a good number of spells before you will have to consume an Ashen Estus Flask. Should you be mostly melee focused, it is a good idea to use weapons with high bleed capability, as an example, Exile Greatsword infused with Blood Gem but any bleeding build you are comfortable with will work, preferably with greatswords though. As a personal recommendation, it is suggested to kill Demon in Pain first as the following fusion of both demons has fewer wide-range attacks and slower attacks that can be dodged easily. Keep repeating the previous steps and dodge Demon Prince's attacks and this fight should be no problem. Demon Prince has 2 different phases, depending on which of Demons (in Pain/from Below) was slain last. Flaming Reunion After killing last demon (Demon in Pain OR Demon from Below), fire gathers inside its corpse. Few second later there is an explosion with small AoE dealing fire damage for 50% of attack's duration, which ignites the boss fight arena. This move opens the fight with Demon Prince and he does not use it later. Fireball Creates a ball of fire in his right hand and leaps up, throwing it towards the player and then landing a few feet away from its original position. Fiery Swoop Flies up and swoops down, slashing the ground with its claws in a forward motion and leaving a pool of lava. Critical Grab Demon Prince - twice - tries to grab player. If he succeds, he throws him on a medium distance dealing physical damage. Triple Seething Chaos Demon Prince throws 3 fireballs on small distance, which acts identical to Seething Chaos spell. Deals high fire damage. Air Wave Demon Prince uses his wings to create an air wave, which knocks out player, and lands few feets away. Deals no damage, but may put player in a difficult situation. Usually used before Fireball Shower or Laser Beam. Fire Serpent Demon Prince rotates 180 degrees and attacks ground with his right claw. This attack releases a Fire Serpent, which acts similar to "Black Serpent" spell. Deals physical and fire damage. Often appears after Modified normal moveset. Modified normal moveset Demon Prince will strike with his claws in a similar way, as Demon in Pain or Demon from Below in "flame" mode. This time however, these attacks are far more aggressive and faster. Fiery Shout Demon Prince tries to scare off enemy by performing a fiery shout. Sometimes performs after regular attacks. Floating Chaos (Red Variant) Casts an enhanced version of Floating Chaos that fires at the player. Usually leads to Fireball Shower. Only available when the Demon Prince is revived from the red Demon from Below. Note: After Demon Prince death, they instantly disappear. Quick Floating Chaos + Fire Serpent (Red Variant) Demon Prince casts a short version of Floating Chaos and flies away. Then he moves his right arm to the back (like he is scared of something) and attacks swiftly with his hand, what releases a Fire Serpent. Only available when the Demon Prince is revived from the red Demon from Below. Fireball Shower (Red Variant) A follow up after casting Floating Chaos, the Demon Prince builds up a ball of flame from its mouth that results in fireballs chasing player and - if they manage to hit - deal very high fire damage. Good chance to get some hits in. Cue for evacuation would be the bright flare after casting. If Demon Prince is staggered at this moment, fireballs will fall around him. Only available when the Demon Prince is revived from the red Demon from Below. Laser Beam (Orange Variant) A sweeping laser beam that does massive damage if connected. Lasts for quite a while as the Demon Prince sweeps it left and right. If dodged correctly, the player can punish for massive amounts of damage by simply staying behind the Demon Prince. Can be easily avoided by performing a "Stretch Out" gesture. Usually leads to Laser Burst. Only available when the Demon Prince is revived from the orange Demon in Pain. Laser Burst (Orange Variant) An explosive beam that does damage through the beam itself and also in an AoE around the Demon Prince's head. Usually cast right after the laser beam. The player can get behind the Prince and continue their combos without getting severely damaged. Can be easily avoided by performing a "Stretch Out" gesture. Only available when the Demon Prince is revived from the orange Demon in Pain. • Because of the differences in body type between the Old Demon King and the Demon Prince, it is unlikely that this boss shares any relation to the Old Demon King. The moveset of the Demon Prince depends on which demon in the first phase is killed last (see "Attacks" information). If player manages to defeat the second demon (in Pain OR from Below) with a critical strike, the beginning of this fight will look slightly different. Before events of Dark Souls III - as is said in Lorian's Greatsword description - Lorian managed to defeat Demon Prince. Older description of Soul of Demon Prince stated, that he retreated to beneath the Earth. This helped him survive, as Lorian thought he died during battle. 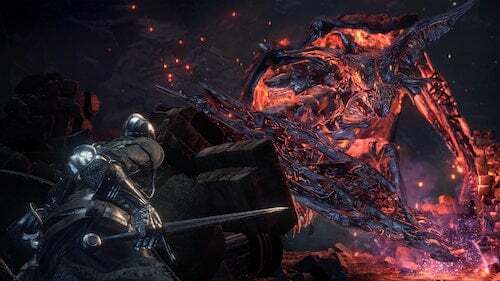 Boss fight arena is a devastated Firelink Shrine from Dark Souls I.
Demon Prince shares the same tail with the Centipede Demon, a boss from Dark Souls I. In contrast to Dancer of The Boreal Valley and her "fire traces", fire caused by Demon Prince "Flaming Reunion" attack after defeating him will last forever. At one time during development (when there was a Crimson Bat instead of Demon in Pain) the Demon Prince had an additional name - Crimson Prince. This name occurred, when the player defeated Demon from Below instead of Crimson Bat. Bug (during jolly cooperation, very rare): Soon after the beginning of this phase and hitting Demon Prince, despite fact that he is still alive, I got message "Heir of Fire destroyed" and prize for doing it. Bug (very difficult to achieve in co-op, impossible when solo): If the player manages to perform a critical strike on a last living demon (in Pain OR From Below), while it's HP is 0, 2nd phase will begin instantaneously and Demon Prince will spawn with 1 HP. This boss was a joke with the 2 NPCs, did it first try. Doesn&apos;t even need players help. I doubt i could ever solo it though.. The area where you fight them...is that Shrine of Amana? This could actually be the son of Covetous Demon and Mytha the Banefull Queen (DS2) Think about it he&apos;s in the area around Earthen Peak and is a Demon. Welp, Imma now make my black knight sword +10 And infuse it with bleed. Got this guys 1st try going in blind and with no summons. Am i missing something? 4/10 boss, at least it wasn&apos;t Freide. I&apos;m comparing all bosses to Freide from now on, 10 being Freide. Optional - however, must be defeated in order to reach The Ringed City. I am just gonna assume whoever wrote this was high AF. A fire demon is resistant to fire but immune to ice...wat? I hate this boss on ng+7,actually im on ng+11. On ng+7 he can do instakill and has amount of health , first battle its easy on ng+7 but when it becomes in his final form its tootal insane ,i kill him once on ng+10 but died 100 s times. I just killed him solo on the 3rd try, why are people having so much problems with this boss? There is an error in the attacks tab. Demon from Below is the Orange one, not Demon in Pain. Dorhys&apos; Gnawing is definitely the best for pyros for this fight. Spec to 40/40 and use Sunless Talisman and you&apos;ll do tons of damage. Summon Lapp too. Since they&apos;re demons, I assume they&apos;re weak to dark, right?